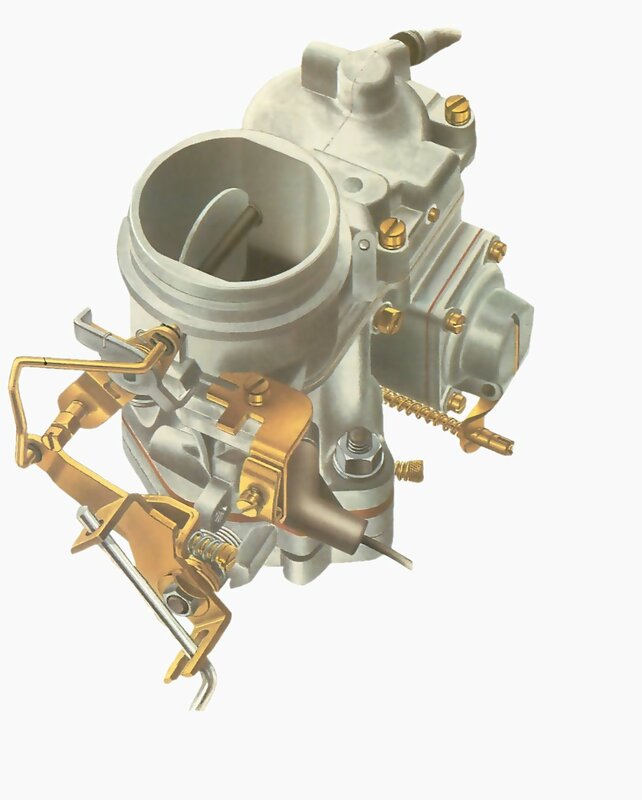 A fixed-jet carburettor mixes air and fuel by means of several jets. The jets are small holes which allow precisely controlled amounts of fuel or air to flow through them. The amounts are governed by the diameter, length and shape of the jets. Typical fixed-jet carburettor Choke disc; thethrottle disc orbutterfly islower down. Bras de tringlede starter Throttle-stop screwrestricting the travelof the lever. Throttle lever, connectedto a throttle rod. Volume-control screw:this one regulates fuelflow. Piped'essence The acceleratorpump delivers alitle extra fuel foracceleration. 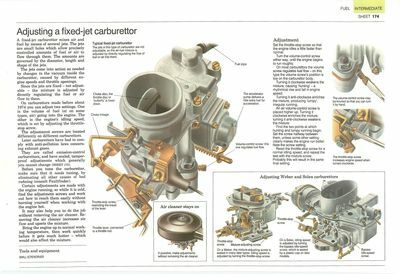 The jets in this type of carburettor are not adjustable, so the air-fuel mixture is adjusted by directly regulating the flow of fuel or air into them. 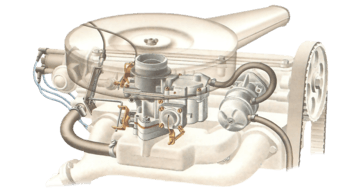 The jets come into action as needed by changes in the vacuum inside the carburettor, caused by different engine speeds and throttle openings. Since the jets are fixed - not adjustable - the mixture is adjusted by directly regulating the fuel or air flow to them. On carburettors made before about 1974 you can adjust two settings. One is the volume of fuel (or on some types, air) going into the engine. The other is the engine's idling speed, which is set by adjusting the throttle-stop screw. The adjustment screws are located differently on different carburettors. 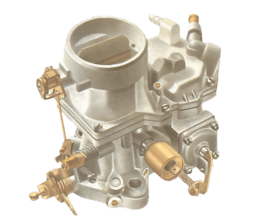 Later carburettors have had to comply with anti-pollution laws concerning exhaust gases. 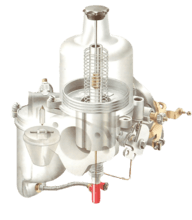 They are called emission-control carburettors, and have sealed, tamperproof adjustments which generally you cannot change (See Adjusting an emission-control carburettor). If possible, make adjustments without removing the air cleaner. Before you tune the carburettor, make sure that it needs tuning, by eliminating all other causes of bad running (consult Faultfinder). Certain adjustments are made with the engine running, so while it is cold, find the adjustment screws and work out how to reach them easily without burning yourself when working with the engine hot. It may also help you to do the job without removing the air cleaner. Removing the air cleaner increases air flow and upsets the mixture. Bring the engine up to normal working temperature, then work quickly before it gets much hotter - which would also affect the mixture. The volume-control screw may be knurled so that you can turn it by hand. Set the throttle-stop screw so that the engine idles a little faster than normal. Turn the volume-control screw either way, until the engine begins to run roughly. The throttle-stop screw increases engine speed when turned clockwise. 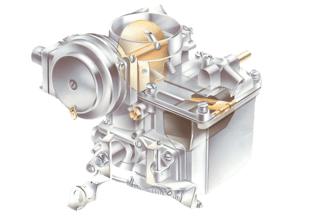 On most carburettors the volume screw regulates fuel flow — on this type the volume screw's position is low on the carburettor body. Turning it clockwise weakens the mixture, causing 'hunting' — a rhythmical rise and fall in engine speed. Turning it anti-clockwise enriches the mixture, producing 'lumpy', irregular running. An air volume-control screw is placed higher up. Turning it clockwise enriches the mixture; turning it anti-clockwise weakens the mixture. Find the two points at which hunting and lumpy running begin. Set the screw halfway between them, unless some other setting clearly makes the engine run better. Note the screw setting. Reset the throttle-stop screw for a normal idling speed, and repeat the test with the mixture screw. Probably this will result in the same final setting. On a Weber, the mixture-adjusting screw is sealed in many later types. Idling speed is adjusted by turning the throttle-stop screw. On a Solex, idling speed is adjusted by turning the bypass idle-speed screw, which is sealed by a plastic cap on later models.